IT’S GARDEN PARTY TIME Event brings together local food community. A VISION FOR TUSCALOOSA City seeks input to help shape the future. Vacuum refrigerator condenser coils to improve efficiency. Fix or replace faulty electrical cords and plugs. who’ll be visiting for Thanksgiving this year, where the turkey dinner will be served, and what items need to be added to the list for Santa, it’s also important to remain present in what is happening now. Enjoy the weather and play some football, visit a corn maze, take a hay ride, or jump in some of those leaves before the piles are raked up. If you’re looking for away-from-home activities, check out a local fair, or go camping! Cut down on screen time. This means cell phones, iPads, televisions, and all things electronic. The intense concentration our kids reserve for watching cartoons or videos, or playing games for extended periods, can be spent more productively. To be successful in school, children need intentional focus. Find activities for them at home that require active participation. This can be a big helper for school! Local mom Michele Erdman has found that getting things done immediately after school helps her girls stay engaged and on top of their schooling. “I ask every day when they get home what they did and what they learned,” Erdman said. “We have a rule that homework is done immediately after school before anything else.” Here’s to a happy, enjoyable upcoming holiday for all of us – and to getting over the “Mid” Itch. Marlena Rice is a busy mom and writer who lives in Tuscaloosa with her husband, Rod, and their son, Beaux William. Check out her blog at heartfullybuilt.com. voice their fears, disappointments, and even failures was a great encouragement to me. I remember thinking, “I’m not the only one!” And on other occasions, I thought, “At least I’m not facing that issue.” But those conversations were scattered, and the challenge of raising teenagers was a daily struggle – with something new always around each corner. I hope what I am writing is resonating with you. And if it is, let me assure you that there is a community full of parents who need you as much as you need them. That’s right, they need you. and say just say, “Please, help me.” Another option may be speaking up in your church, or Bible study, and asking, “What do I do?” For those of you in such groups, when you hear a parent make a joke about their kids, realize it may be a very real cry for help. Don’t just laugh at their circumstances. Invite them out for a coﬀee, and share your own story. It all comes down to speaking up. Your family and kids are just that important. Take a risk today. Allison Adams is a mom of four and a Realtor with Lake Homes Realty serving Lake Tuscaloosa. For comments, email aadams@lakehomes. com. The Land of Oz: How to Make Your Thanksgiving Miserable (Some Bad Holiday Advice) By Derek Osborn A monthly editorial piece of masterful opinionated writing (insert joke here) regarding life and times in the big town of Tuscaloosa, coupled with the musings of a guy nicknamed “Oz.” Isn’t it odd that some people love the holidays, and all the associated gatherings, while others despise even the notion? I’ve always loved the holidays and the overabundance of food and the weird, hybrid Thanksgiving recipes brought by each person that walks in the door. I’d always heard that you can’t ruin dressing. Yes. Yes, you can. You can absolutely, positively, 100 percent ruin dressing. When preparing for a holiday gathering, you deﬁnitely have to get your mind right. My mindset has always centered around hoping for the best – yet realistically expecting the worst, while not openly being pessimistic. Here is the reality: Someone, if not an entire household, is going to show up late. If your gathering is scheduled at 11 a.m., you probably won’t eat until 1 p.m. Also, there will be a relative who brings someone who wasn’t invited. Again, get your mind right. If you acknowledge these occurrences beforehand, they become a lot easier to digest once they come to fruition. However, if you are intent on making the party pathetic, here are some sureﬁre ways to make it happen (which means, do NOT do these things): Sign up to bring green bean casserole, and instead take Jell-O Salad: This is a great way to tick almost everyone oﬀ. Just about everybody loves green bean casserole. It can sometimes be the most appealing thing on the table. But NOBODY likes Jell-O Salad. It’s not even salad. Bring a new signiﬁcant other that none of your family has met: Family members expecting a family-only event will not cherish this decision. It may also create incredibly awkward, silent moments at dinner. Fun! Begin a conversation relating to politics: If there is one thing the country, and your family, can’t agree on right now, its politics. So, yeah! Go for it. But no… DON’T. You are not going to change anyone’s mind, and they aren’t going to change yours. It’s a trap. Bring homemade cranberry sauce: No, don’t do this either. If you can’t see the can imprint on the cranberry, then it’s not Thanksgiving. Accept no substitutions. Tell everyone about your top-notch parenting skills (and indirectly imply how horrible everyone else is at it): Want to tick someone oﬀ while not necessarily meaning to tick someone oﬀ? Explain to everyone how great you are at raising kids while giving advice to others on how to raise theirs. On second thought, don’t. Everyone faces their own set of challenges in life, and no one is an expert on this one. Avoid. Get out your phone and start early Black Friday shopping at the table: No!! Put the dang phone down. Please. Just for a little while. For the love of… But in all seriousness, enjoy yourself. Relax. And Happy Turkey Day. I have been told for many years I have the voice and knowledge for it. What’s your guiding business principle? Always put the client ﬁrst. What’s the best advice you’ve ever received? Live life with honesty and integrity and exhibit good manners. What’s your hidden talent? I can remember college football and college basketball statistics with the best of them. Our surgeons have experience using the latest technology in robot-assisted, minimally invasive surgery for a variety of surgeries. Caroline Baxter Ford Welcome Caroline Baxter Ford to Druid City Media! Caroline has extensive experience in managing a business in a very competitive market. She managed Organic Harvest in Birmingham while national chains like Whole Foods moved into the area. Organic Harvest has been very successful, but Tuscaloosa lucked out when Caroline fell in love with a local here, Michael Ford. Caroline is a marketing accounting executive who has been on the business owner side, and she truly understands the needs and challenges they face. If you are interested in growing your business with Druid City Media, call Caroline at 205-569-8109 or carolinebaxterford@gmail.com. and manages all aspects of grant writing and reporting while advocating for or against actions which are important to the mission of Shelton State. Koh’s new role at the college began on Sept. 1. 3 Dr. James W. Evans has joined the medical staff of the Lewis and Faye Manderson Cancer Center as a medical oncologist/hematologist. He comes to the Manderson Cancer Center from the Birmingham area, where he worked as a medical oncologist for three years. The Manderson Cancer Center is located on the campus of DCH Regional Medical Center. of Cottondale. Smith’s Machine has manufactured precision parts for many industries, including the military and aerospace industries, for decades. ARCH Global Precision is a Michigan-based company that is focused on precision machined components and cutting tools. 2018 Gold Retailer of the Year Award in the $5 million to $20 Million Annual Sales Category from the Alabama Retail Association. The Alabama Retailer of the Year awards honor retailers who have demonstrated growth, innovation, and a commitment to their respective communities. B&W Foods Partner Jay Welborn accepted the Silver Retailer of the Year Award in the $20 Million Plus category. B&W operates four Piggly Wiggly stores in Tuscaloosa and Northport. The Alabama Retail Association today honored Gill and Welborn at its Retail Day luncheon in Birmingham on Oct. 16.
has announced the 2018 recipients of the University’s highest honor for excellence in teaching – the Outstanding Commitment to Teaching Awards. This year’s honorees are Stacy Latham Alley, director of musical theatre and an associate professor of musical theatre and dance; Dr. Rich Houston, director of the Culverhouse School of Accountancy and the Hilton Dean Professor of Accounting; Dr. Mary Meares, associate professor in the communication studies department; and Nathan James Parker, instructor in UA’s creative writing department. DCH Foundation to Hold 41st Annual Lucy Jordan Ball on Nov. 9 By Faith Henley Few Tuscaloosa experiences can compare to the glamour and charm of The Lucy Jordan Ball. The DCH Foundation will host the 41st annual ball on Nov. 9 at 6 p.m. at NorthRiver Yacht Club. Attendees will gather this year in support of The Finn and Quinley Children and Infants’ Fund. “This year’s ball is just as special as its recipient, the Finn & Quinley Infant and Children’s Fund of The DCH Foundation,” said DCH Foundation Director of Development Brandt Lapish. “The Fund has made nearly $1 Million worth of technological and training improvements in our maternity and neonatal care units, our emergency rooms, and many other departments who serve our youngest patients.” The Finn & Quinley Infant and Children’s Fund began in 2004, when Danielle and Michael McInerney lost their premature twins after eight days in the Northport Medical Center’s neonatal intensive care unit (NICU). The McInerney’s created the fund in the twins’ memory to help other parents in similar situations. The fund also helps both DCH campuses with needs for the NICUs, pediatrics, and maternal/child areas of the health system. “Speciﬁc projects have included the Giraﬀe Omnibeds, our Child Life Specialist, a digital infant footprint scanner, and many key training programs and technologies that strengthen our clinical staﬀ and physicians’ ability to help our newest patients get the best possible start in life,” LaPish said. at age 97 in August of 2017. Jordan’s legacy will continue to be felt, and honored, with the Lucy Jordan Ball. Each year’s Lucy Jordan Ball has a unique theme, such as “A Night in Havana,” “Pretty in Pink,” or the “Black and White Ball.” LaPish said this year’s theme, “The Secret Garden,”will be a special treat for both new and returning attendees. Anyone interested in attending the 2018 Lucy Jordan Ball should contact The DCH Foundation at (205) 759-7349 for more details. to learn about the Framework process and get involved. Crites said the city wants Tuscaloosa residents from all walks of life to come to this interactive workshop to make their opinions on the city’s future heard. “The plan cannot be successful unless Tuscaloosa residents buy into it,” Crites said. “No one knows the community and its needs like the ones living in it.” For more information and to get involved with Framework, visit framework.tuscaloosa.com. How to Grow Your Business When the Owner is Out of Time By Hanson Watkins Tuscaloosa is a relationship town. Your plumber knows the secretary at your church, and their kids all play soccer with yours. Relationship marketing is one of the main ways Tuscaloosans do business with each other. But if you are a small business that depends on relationship marketing, your budget is probably not big enough to support a fulltime sales person (most people can’t live on $17,500). So that leaves all of the sales eﬀorts on the shoulders of the owner. The average expenditure on marketing for a small business is about 7 percent, according to the Small Business Administration. If you are a small business that grosses $250,000 a year, that is $17,500. possible for the business owner to do themselves on a basic level. There are lots of tutorials and training for free on the internet. The question... Is it worth it to spend time to learn how to do something you are going to do once, or infrequently? It may make more sense to outsource it, depending on how you value your time. These are regular reminders, updated info, deadlines – whatever your customer ﬁnds useful (please don’t spam) that keep your business at the top of your customer’s mind. Outsource costs range from about $500 to $2500, depending on complexity. The good news is, most business can get an eﬀective campaign at the lower end of this range. And this is a one-time cost that can be used for years. Are you a dealer for a speciﬁc product? Do you have a specialty that is speciﬁc? For example, are you an attorney that focuses on mining litigation? Or are you the only dealer of Plumbing Widget A in the Southeast? Adwords campaigns can help customers that are looking for something speciﬁc ﬁnd you at a reasonable cost to you. It is best used for lead generation, or for selling speciﬁc items. To outsource a basic campaign, set up starts at around $500. Heavily managed, or complex campaigns, can be very expensive, but they are typically not needed in smaller markets. Direct ad costs vary depending on the competitiveness of the industry. However, the costs can be very low for speciﬁc search terms – even as little as a few hundred dollars per year. Almost no purchased lead list is usable in its original form. The next step is always cleaning up the list and getting corrected information. You can pre-qualify leads and get corrected contact information by using an outsourced call center with a script you approve. This is one of the more expensive outsource options starting at $1200+, but it’s also signiﬁcantly less hassle than trying to set up your own mini-call center, or trying to get overworked staﬀ to do calls. This is great for professionals that have extensive past client lists, but who are having a hard time getting around to touching base with them. It’s also great for businesses that need to reach outside of their current network and need a place to get started. If your business is not growing because of lack of time, there are options. This is a great time of year to plan for growth in 2019. Family Counseling Service: The Keys, and the Path, to Personal Growth By Larry Deavers The path to personal growth involves a courageous self-examination, stepping outside our comfort zone, and taking on new challenges. Here are some ideas to help you get started on making the changes you’ve always wanted to, but never quite followed through on. People committed to personal growth don’t settle for simply blaming others for their problems. We all have ﬂaws. Once you determine to look at any challenging interactions with other people as learning experiences, rather than threats, you gain valuable insight into yourself, your ability to communicate and your ability to appreciate others. Seek feedback from those who know you best, both at home and at work, with a welcoming attitude. Listen, unafraid, and identify areas where you can grow. Take on something that intimidates you and set a goal to become proﬁcient at it. Facing our fears frees us from the power they have over us. It will be intimidating in the beginning, but if you take those ﬁrst one or two steps towards facing that challenge, often you will discover that your fear has been greatly exaggerated. You are capable of more than you give yourself credit for. You can learn something from anyone. It’s easier to learn from those you admire, but everyone has some strength, skill, or piece of wisdom you can adapt to make improvements in your own life. Ask yourself, “How can I learn from them and adopt that skill for myself?” This is a humbling experience, but it also reframes your interactions with others as growth opportunities, even with those with whom you have a diﬃcult relationship. Set out to develop positive habits and stick with them. You already know what habits you want to establish; maybe you’ve struggled with them for some time. Renew your commitment to make this new habit a routine – same time, same place, same behavior – as much as possible. Then, determine to take one step, no matter how small, towards your goal every day. Start by telling one or two others your plans, and ask them to hold you accountable. Taking that step will give you the impetus to move forward. As far as it is possible on your part, make a sincere eﬀort to make amends with others who have a grievance against you. Even if you have no ill feelings towards them, taking the initiative to restore a broken relationship can be extremely freeing and empowering. Releasing those past painful experiences will enable you to grow and not be quite as burdened by the past. If these steps sound intimidating, start with something small, and build on that. The journey of a thousand miles begins with one step! Hotel Capstone loves to work with Toys for Tots. It is one of our main events, and we typically are the largest single donation. We collected more than 200 toys last year! Ashley Russell and Tracy Channell Hotel Capstone We want to share more stories about Tuscaloosans giving back in 2019. If you, your business, or a friend is giving to the community, please email us at editor@druidcity living.com with the subject line “Tuscaloosa Gives Back.” That which you shine a light on, grows. Executive Director Stephanie Reinhart. “Our hands-on curriculum encompasses so many facets: increasing children’s knowledge of food systems; expanding their list of favorite fruits and vegetables; experiential education lessons that meet Alabama Education standards; and working every day to curb the trend of childhood obesity by getting children to make healthy food choices.” To learn more about Schoolyard Roots, or to get involved, visit schoolyardroots.org. Tickets to the Garden Party can be bought in advance at thegardenparty.brownpapertickets.com. abama, and one of the top industries nationwide,” Pierson said. “There are plenty of job opportunities, and these are careers that value work experience, so we help make management opportunities open up sooner for our students.” In addition to work experience, the program oﬀers certiﬁcations for students that they may need in these positions, at no cost to them. Students who are interested in careers supported by the Tuscaloosa Career & Technology Academy should meet with their guidance counselor for career assessment to determine if the school is a good ﬁt for them. The school is open to students in grades 9 through 12. It is a part of the Tuscaloosa City School System, but spots are available for students in Tuscaloosa County schools. It is not a separate school, but rather oﬀers coursework in conjunction with time and courses at the student’s principal school. 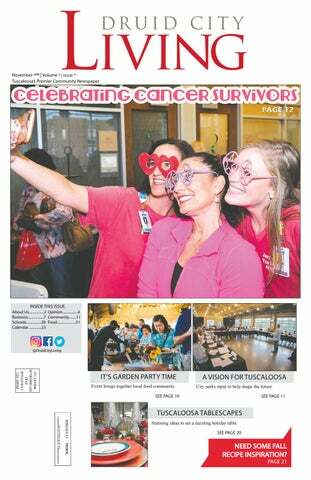 Tuscaloosa Tablescapes Nov. 8, 6 to 8 p.m.
SWEET AND SPICY CHICKEN • 1 1/4 pounds boneless, skinless chicken breasts cut into 1-inch pieces • 1/3 cup cornstarch • 2 eggs, beaten • 3 tablespoons vegetable oil • 1/3 cup Buﬀalo hot sauce • 1/2 cup brown sugar • 1 tablespoon rice vinegar • 1/4 teaspoon red pepper ﬂakes (or more to taste) • 1/4 cup sliced green onions • Salt and pepper to taste • Cooking spray • 4 cups cooked rice Preheat oven to 350 degrees. Line a 9x13 baking dish with foil and spray with cooking spray. In a large bowl, season chicken with salt and pepper, sprinkle on cornstarch, and toss to coat. Heat oil in a large skillet over medium-high heat. Dip each chicken piece in beaten eggs, and place in skillet. Brown each side, then place in a single layer in the baking dish. Whisk together buﬀalo sauce, brown sugar, rice vinegar, and red pepper ﬂakes, and pour over chicken. Bake for 35 minutes. Serve over rice, and sprinkle with chopped green onions. to tailgate on the Quad with friends or throwing a home watch party, whip up this corn and black bean salsa/ dip and watch it disappear. I hope all of you have a wonderful Thanksgiving, and bon appétit! Amy Poore is a Tuscaloosa mom, wife, and foodie. To see more of Amy’s delicious recipes, visit her blog, Poore Amy, at pooreamy.com. Photos by Amy Poore. CORN AND BLACK BEAN SALSA/DIP • 1 can black beans, drained and rinsed • 1 can white shoe peg corn, drained • 1 can mild green chilies, drained • 1/2 red pepper, chopped • 2 Tablespoons chopped jalapeños • 3/4 cup chopped cilantro • 1/3 cup apple cider vinegar • 2 1/2 Tablespoons vegetable oil • Salt and pepper to taste Mix all ingredients in a large bowl, cover with plastic wrap, and chill in the refrigerator for at least 2 hours. Stir well before serving. Stir occasionally throughout the time that it is served. Double the recipe for a large crowd. Tuscaloosa’s Veterans Memorial Park will be filled with veterans and their families for the annual Veterans Day program on Monday, Nov. 12. This year’s guest speaker is University of Alabama Associate Vice President of Facilities and Grounds Colonel Duane Lamb. Colonel Lamb served for 30 years in the U.S. Air Force, and he has been awarded 25 military medals – including the Defense Superior Service Medal, two Legion of Merit Medals, the Bronze Star, and the Purple Heart. The program, which begins at 10 a.m., is a joint event by the Tuscaloosa County Park & Recreation Authority and the Tuscaloosa V.A. Medical Center. It is free and open to the public and all branches of the military. Beat Auburn Beat Hunger Food Drive: Now through Nov. 15. Since 1994, the Community Service Center and the West Alabama Food Bank have united students, faculty, staﬀ, alumni, and community members to help “ﬁght” hunger and poverty in West Alabama by challenging Auburn University and the Food Bank of East Alabama to see who can collect more non-perishable food to help the needy. For more information, visit beatauburnbeathunger.ua.edu. Kentuck Art Night in Downtown Northport: Nov. 1, 5- 8 p.m. This monthly celebration of art and artists is free to the public. Enjoy live music, pop-up shops from local vendors, demonstrations by Kentuck studio artists, and more. For more information, visit kentuck.org/ art-night. All Saints’ Day Choral Evensong: Nov. 1, 6-8 p.m. Christ Episcopal Church, downtown Tuscaloosa. This evensong will remember and honor those who have died, especially during the past year. Their names will be read during the service, which features choirs singing traditional hymns. The service is free and open to the public. For more information, call (205) 758-4252 ext. 120. First Holly Days Christmas Market: Nov. 2 (10 a.m.-6 p.m.) and Nov. 3 (10 a.m.-2 p.m.). First Baptist Church Fellowship Hall, downtown Tuscaloosa. This holiday market features a bake sale, unique gifts, decorations, children’s clothing, pottery and more. For more information, visit ﬁrsttuscaloosa.org/hollydays. ACTFest 2018: Nov. 2-4, Bean-Brown Theatre, Tuscaloosa. Theatre Tuscaloosa is hosting this event, which involves eight community theatre companies from throughout Alabama presenting 60-minute performances. For tickets, including weekend passes, visit theatretusc.com. First Friday in Downtown Tuscaloosa: Nov. 2, 5 p.m.- 8 p.m. This event is free to the public. Local galleries, businesses and restaurants are open as a way for the community to see what downtown Tuscaloosa oﬀers. For more information, visit ﬁrstfridaytuscaloosa.com. Storm Science at CHOM: Nov. 3, 9 a.m.-4:30 p.m. Children’s Hands-On Museum of Tuscaloosa (C.H.O.M. ), downtown Tuscaloosa. Create hurricane art, adopt a pet cloud, make a tiny tornado, and experience a storm in a jar. All activities included in admission. For more information, visit chomonline.org. Sprayberry Star Market: Nov. 3, 9 a.m.-1 p.m. Lloyd Wood Education Center, Northport. The Sprayberry Education Center PTO is hosting this shopping market. This is a great opportunity for residents to come out and shop for bargains for a great cause. For more information, email sprayberrytwts@gmail.com. Black Warrior Brewing 5th Anniversary Celebration: Nov. 3, Noon-until. The celebration will include the addition of 5 specialty anniversary beers, Live Music by Matt Jones, and cheering the Tide on to a victory against LSU. A full pig from Spencer Farms will be roasted and served throughout the day along with sides from Southern Ale House. West Alabama Walk to End Alzheimer’s: Nov. 4, 1:30-5 p.m. Medeiros Park, downtown Tuscaloosa. Registration for this two-mile walk begins at 1:30 p.m.; walk starts at 2:45 p.m. Proceeds beneﬁt the Alzheimer’s Association. For more information, or to register, visit act. alz.org/westalabama. West Alabama Food Bank’s “All Aboard” Event: Nov. 8, 6 p.m. Tuscaloosa River Market. Area restaurants will provide their favorite dishes for this event, with proceeds beneﬁting WAFB. For tickets, visit westalabamafoodbank. org. 2018 Chamber in Session - State of the Economy: Nov. 8, 7:30-9 a.m. Embassy Suites, Tuscaloosa. This event focuses on the current health of the local economy, including a future forecast for key areas of growth – such as industrial, retail, commercial, and tourism. For more information, email jill@tuscaloosachamber.com. Fourth Annual SERVPRO Golf Tournament: Nov. 8, 8 a.m. (shotgun start), Ol’ Colony Golf Complex, Tuscaloosa. Proceeds from this tournament beneﬁt Habitat for Humanity Tuscaloosa. This tournament has raised thousands for area charitable organizations. To register, or to become a sponsor, visit servprottowngolf.com. Tuscaloosa Tablescapes: Nov. 8, 6-8 p.m. Tuscaloosa Career & Technology Academy. This come-and-go showcase features beautiful fall and holiday tablescapes designed by local interior designers and decorators, caterers, restaurants, ﬂorists, and more. Proceeds beneﬁt students in the Hospitality and Tourism program at TCTA. Tickets: $10. For more information, including tickets, visit tuscaloosatablescapes. eventbrite.com. TA Players Present “The Somewhat True Tail of Robin Hood”: Nov. 9-11, Bama Theatre, downtown Tuscaloosa. For tickets and show times, visit taplayers.booktix.com. 41st Annual Lucy Jordan Ball, The DCH Foundation: Nov. 9, 6-11 p.m. NorthRiver Yacht Club, Tuscaloosa. For more information, including reservations, call (205) 759-7349. 3rd Annual Tuscaloosa Runs for Veterans Run/Walk 5K: Nov. 10, 8-10 a.m. Tuscaloosa VA Hospital (3701 Loop Road). Sponsored by the Chamber of Commerce of West Alabama’s Veterans Aﬀairs Committee, the event will be held to provide support to several local charities, including the Tuscaloosa Veterans Memorial Park, the Tuscaloosa VA Medical Center Homeless Shelter, and more. Registration (on site): $25. To register, visit ttownrunsforvets2. eventbrite.com. Honor Our Veterans Day at CHOM: Nov. 10, 9 a.m.-4:30 p.m. Children’s Hands-On Museum of Tuscaloosa (C.H.O.M. ), downtown Tuscaloosa. Make a card to send to the Tuscaloosa Veterans Aﬀairs Medical Center or to give to a veteran you know. All activities included in admission. For more information, visit chomonline.org. Calico Street Troupe Performance: Nov. 10 and 17, Dec. 1, 10:30 a.m.-Noon, Northport Civic Center. Bring the whole family to this free, interactive, professional stage play for kids and their families, which features costumed actors, dancers, special lighting, and music – all on a 36-foot stage. Performances teach right choices and good character. For more information, visit calicostreet.com. Woofstock: Nov. 11, 2-6 p.m. 11550 Stonehedge Road, Northport. This event supports Well Worn Paws – the Canine Compassion Fund’s future senior dog sanctuary. Enjoy wine and craft brews, a silent auction, and live music. Tickets are $20, and available online at caninecompassionfund.org and at Nancy & Co. Fine Jewelers. Schoolyard Roots’ Garden Party: Nov. 11, 5:30 p.m. Tuscaloosa River Market. This 7th annual event is a feast for foodies, with seasonal, local, farm-to-table tastings, and more. For more information, and tickets, visit schoolyardroots.org/thegardenparty. Chamber Business After Hours: Nov. 13, 5-7 p.m. Alabama One Credit Union, Tuscaloosa. For more information, visit tuscaloosachamber. com. 2018 River Pitch Competition: Nov. 14, 5-9 p.m. Tuscaloosa River Market. The River Pitch Business Idea Competition is an event for students and community members to pitch their ideas – in just three minutes. You can win up to $1000, get valuable feedback on your idea, and meet people who might be able to help you develop your idea into a business. For more information, visit Culverhouse.ua.edu. ECW Fall Bazaar and Bake Sale: Nov. 15, 10 a.m.-2 p.m. Randall Hall of Christ Episcopal Church, downtown Tuscaloosa. This annual event features original art, jewelry, cakes, pies, muﬃns, cookies, casseroles, and sides. Proceeds beneﬁt the Episcopal Church Women of Christ Episcopal Church to fund outreach programs, and more. For more information, visit christchurch1828.org. Sixth Annual Purchase with a Purpose Party: Nov. 15-16, 6-9 p.m. Ridgecrest Baptist Church, Tuscaloosa. Vendors will include adoptive families, local nonproﬁts, fair trade artisans, and global missions, with all proceeds going back to those represented. Admission is free. Coﬀee and cookies will be served for shoppers. For more information, visit purchasewithapurposeshop.com or Purchase with a Purpose on Facebook. TTC/Wagner’s Turkey Trot 2 Mile Race: Nov. 17, 8 a.m. Wagner’s RunWalk in Midtown Village, Tuscaloosa. This family-friendly run or walk two-mile race serves as the membership drive for the Tuscaloosa Track Club. Your entry fee is also your membership to The Tuscaloosa Track Club for 2019. Applications are available at Wagner’s RunWalk in Midtown Village. Quirky Turkey at CHOM: Nov. 17, 9 a.m.4:30 p.m. Children’s Hands-On Museum of Tuscaloosa (C.H.O.M. ), downtown Tuscaloosa. Play roll-a-turkey, make a “good luck” football turkey, and pin your feather on a turkey. All activities included in admission. For more information, visit chomonline.org. Tuscaloosa Symphony Orchestra Presents “A Little Night Music” with Chamber Orchestra: Nov. 19, 7 p.m. First Presbyterian Church, downtown Tuscaloosa. In the serene sanctuary of the First Presbyterian Church, two incomparably beautiful Mozart serenades usher in the holiday season; conducted by Adam Flatt. For more information, and tickets, visit tsoonline. org or call (205) 752-5515. Holidays on the River: Nov. 21 through Jan. 15, Tuscaloosa Amphitheater. With Ice skating, music, visits from Santa and more, this event oﬀers something for the entire family. For more information, and tickets, visit holidaysontheriver.com. Show Your Spirit at CHOM: Nov. 24, 9 a.m.4:30 p.m. Children’s Hands-On Museum of Tuscaloosa (C.H.O.M. ), downtown Tuscaloosa. Design a spirit shaker, make a mascot mask, and play tailgate games. Wear your team colors! All activities included in admission. For more information, visit chomonline.org. Make a difference in your community. Be a part of your communityâ&#x20AC;&#x2122;s success. Because when community succeeds, so do you. Volunteer with CSPWAL today. CSPWAL offers volunteer opportunities in childhood education, support services, and housing needs for low-income and special needs citizens. From Meals on Wheels to Head Start Program, CSPWAL has something you can get involved with.